Sieve the flour into a large mixing bowl and add a pinch of salt. Make sure you stir it well into the flour, so the salt doesn’t come in direct contact with the yeast at the next stage. Heat the milk in a heatproof mug over a low heat until warm. Add a little sugar and stir well. Transfer half of the milk into a glass. Between the tips of your fingers, crumble the yeast into the glass. Stir well until the yeast dissolves. Add a pinch of flour to kick-start fermentation. Cover the glass and leave it in a warm place. When the yeast has risen up to the brim, pour all the contents of the glass onto the flour. Add the remaining milk and knead by hand until smooth. Pour in a little warm water, if needed, to make a dough of medium thickness. Cover and leave to stand in a warm place for an hour. When the dough has risen, transfer it on a floured rolling board. Roll it out until it is 1 cm thick. Dust the dough with some more flour if it starts sticking to either your fingers or the board. With round pastry cutters, cut out shishki and leave them to rest on the board for 15 – 20 minutes. Meanwhile, pour the oil in a frying pan and heat over a medium heat. When the shishki have risen, gently press a little hole in the middle of each one with your finger. One by one, put them in the hot oil and fry on both sides until golden brown. Take them out and place on a napkin or kitchen paper to drain any excess oil. Transfer into a bowl. Serve warm with a dollop of jam placed in the hole of each shishka. 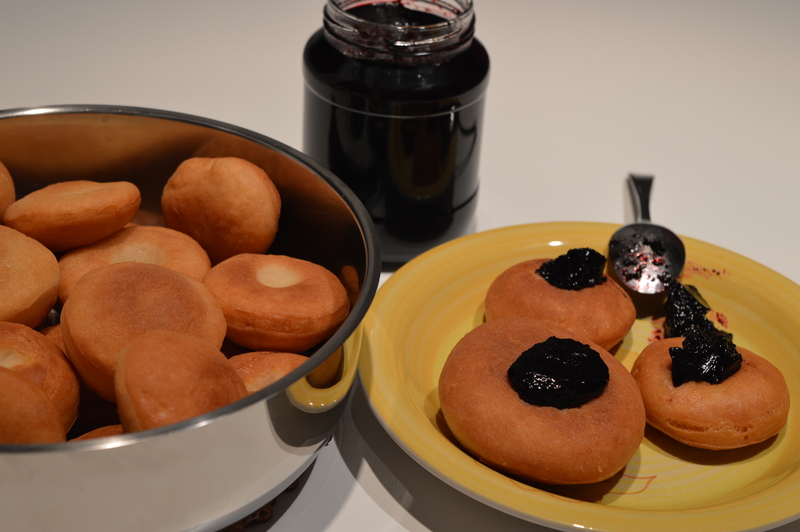 I used my own bilberry jam made from hand-picked bilberries that grow in our forests in the summer – yummy! Another name for šišky (shishki) is pampúšky (pampooshki). There used to be a difference between the two though, as old Slovak cookbooks say pampooshki were larger (the size of today’s doughnuts), and shishki smaller, which is why I have dubbed them mini-doughnuts in my recipe. Anyway, if you want to get doughnuts in Slovakia today, ask or look for šišky (shishki). They are sold under this name in almost all supermarkets and some small deli-shops. being half polish and half slovak, I wondered about the slovak ash weds tradition. On the polish side we have big huge filled donuts called Pączki. I didn’t remember what my Slovak grandma made. It was probably Shishki. We traditionally make them on the Tuesday before Ash Wednesday to mark the end of the Ball/Carnival season and the beginning of Lent.